Council Member Marc Elrich’s lone no vote on the Gaithersburg West Master Plan may have annoyed some of his colleagues, but it could pay off in a big way among the locals! The Gaithersburg West Master Plan that was sent to the Council by the Planning Board was deeply flawed. After months of committee and Council review, the plan has a new name (the Great Seneca Science Corridor Master Plan) and some modest improvements. However, I am still very troubled by some of the underlying concepts and, therefore, will not vote to approve it. The contention that it will create a smart growth live/work community is not supported by facts. The densities will require extraordinary amounts of dollars for infrastructure, with the costs borne largely by Montgomery County taxpayers. And even if those infrastructure investments happen, the quality of life for existing communities will be severely eroded because balance is achieved only by redefining the level of traffic congestion that is acceptable. Another disturbing possibility is that the area will become another set of office parks with a high percentage of non-life science jobs, thereby undermining the intent of the master plan to create a Science City. Elrich’s opposition provoked significant ire from the rest of the council, with one member labeling him “Doctor No.” The council wanted to bury the issue and move on, but Elrich had different ideas. 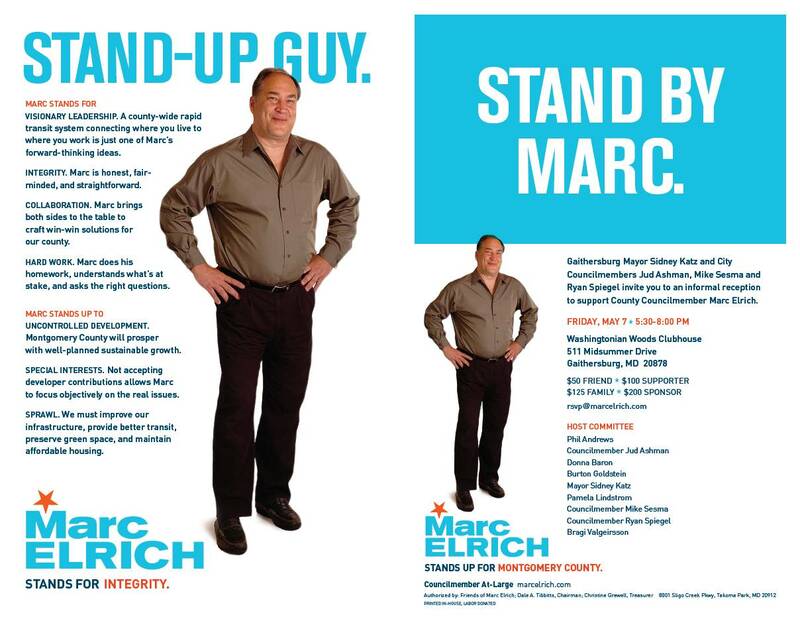 One result of this is that some of Gaithersburg’s most influential citizens are now sponsoring a fundraiser for Elrich. Hosts include Phil Andrews, Gaithersburg Mayor Sidney Katz, Gaithersburg City Council Members Jud Ashman, Ryan Spiegel and Mike Sesma and master plan opposition leader Donna Baron (who lives in North Potomac). Of the twenty precincts, Leventhal won twelve, Floreen won three, Subin won two and Elrich won just one. Two of these precincts did not exist in 2006. Elrich, who served on the Takoma Park City Council for almost twenty years, has had a traditional base in the southeastern part of Montgomery County. With the support of some of Gaithersburg’s most prominent citizens, he could very well expand his geographic reach. Sometimes the best way to get to yes is to say no!